When something terrible happens, one response is to try to get away – away from the people, the places, the memories we might otherwise have cherished but which have now become painful. Another common coping mechanism is to want to talk about our troubles. We want others to know just how badly it hurts. The two disciples in today’s Gospel [Luke 24:13-35] had followed Jesus all the way to Jerusalem, where the most terrible thing had happened. We all know what that’s like. We hope for something, work hard to get it. Then something goes wrong, and the path is blocked by accident, or illness, or injustice. So it is no surprise that the two disciples decided to get out away as fast as they could – on Sunday, the first day after the Sabbath. Maybe they had to get back to work! After all the excitement they had had and the enthusiasm they had felt as followers of Jesus, what a let-down it must have been to return to their regular, ordinary work! But, however eager they were to get away, Jesus’ memory was still with them, and they couldn’t help talking about him to the stranger who had suddenly joined them. And the stranger let them talk. He listened to their disappointment and disillusionment as they told of the dream that had lifted them up – only to let them down. But the stranger didn’t just listen. He also had an answer. Of course, the disciples did not realize who the stranger was. Obviously they were not expecting to see Jesus. He was dead, after all. And dead with him were all their high hopes for Israel’s future. In fact, Jesus would prove to be the one to redeem Israel. But, before they could recognize him, they had to relearn what that meant, what it meant for him to be the Messiah. And who better to teach them than this stranger? So beginning with Moses and all the prophets, he interpreted to them what referred to him in all the Scriptures. We have a short version of what Jesus’ homily might have sounded like in Peter’s Pentecost sermon, part of which we just heard in today’s 1st reading [Acts 2:14, 22-23]. What Jesus did on the road quickly became the Church’s traditional way of reading the Old Testament, understanding the Old Testament through the lens of the Risen Christ and learning to recognize Christ through the lens of the Old Testament. The disciples had interpreted Jesus through their existing beliefs about the messiah – because, rather than see things as they are, usually we see things as we are. In the secular world, we speak of “confirmation bias” – our tendency to interpret new evidence as confirming our already existing and established beliefs. Now, without quite comprehending it, they had reached one of those crises in life when everything seems to break down and a change is required. Without yet recognizing him, they were getting him back. And he was giving them a new image to hold onto and have hope in. And so they urged him to stay. They were beginning to get back their lost hope and didn’t want to lose it again in the night. Once inside, the stranger revealed himself with a familiar gesture, which has since become the Church’s trademark. But this time they didn’t lose hope when he disappeared. He wasn’t gone. The darkness was. He had been with them on the road, a companion in their grief. He had been with them in his homily on the scriptures. And he was with them for keeps in the breaking of bread. So now they couldn’t wait to get back to Jerusalem, that place of pain they had earlier been so eager to leave. And there they heard, “The Lord has appeared to Simon.” Simon Peter, their leader, would proclaim Christ’s resurrection for the rest of his life, beginning with the Pentecost sermon we just heard. And so would those two ordinary disciples, ordinary people like us. And how is the Risen Lord here today for us? The same way he was with them – in the world we live in, in the people around us in whom we frequently fail to recognize him (and whom we may fail to recognize at all). Our preoccupation with ourselves and our problems may hinder us from recognizing him. Still, he walks with us in our disappointments, hears and feels our frustrations, and keeps stride with us as we struggle to hope. He explains himself in the scriptures and stays with us in the breaking of bread, where we finally and fully recognize his Real Presence. And then he sends us, filled with the bread of his body, to announce to the world, in union with Peter and the rest of the Church, that our hope is not just a wish and is more than merely a memory, and that in spite of everything, The Lord has truly been raised – and lives with us still. Back when I was studying political science in the 1960s and 1970s, it was then theorized that the third year of a president's first term could potentially be his most productive. (If my memory serves me right, that view was associated with the famous and influential 1950s presidential scholar Richard Neustadt.) But, of course, that was back when Washington still followed now lost traditional norms, not to mention a more traditional political timetable. That was back when governance was still Washington's main business, before the permanent campaign replaced most serious attempts at governing, before New Gingrich and his spiritual heirs fatally corrupted our politics, before talk radio, social media, and the 24-hour news cycle, etc. Now presidents have much shorter windows in which to accomplish anything - especially if the mid-term election goes against them. Hence the greater pressure to make the best possible use of any "honeymoon." To be fair, Trump can claim a few non-legislative wins in his first 100 days. Perhaps most lastingly, he has apparently succeeded in tilting the Supreme Court's balance rightward for the next several decades. How much he really cares about the Court may be open to question, but certainly many of his supporters do. And, in foreign policy at least, he seems to be learning on the job and has surrounded himself with some clearly competent people (and gotten rid of his most problematic foreign-policy person). On Syria, he certainly seems no closer to a serious strategy than his predecessor, but at least deserves some credit for finally enforcing the Obama "red line" - something Obama himself famously failed to do! In the long run, how he handles North Korea may well turn out to be the more meaningful test case. It has already resulted in a more mature approach to China than his campaign would have led us to expect. All that having been said, his domestic legislative accomplishments thus far are modest at most. While that may be good for the country, it is bad for his Administration's 100-Days scorecard! Some of that may be in part due to his personal unpreparedness, not really knowing how a president works with Congress, and the general unpreparedness of so much of his White House staff. But it also reflects the pre-existing divisions within the Republican party - and the fact that Trump isn't a real Republican and didn't campaign as one, that the conservative movement goals that still seem to motivate many congressmen don't matter much to him, while much of what he campaigned on would be anathema to many of them. 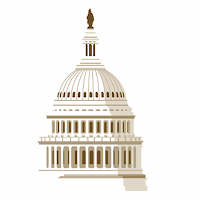 At a juncture in history when the Republican congressional majority remains allergic to the responsibilities of governance, the weakness of White House legislative leadership obviously has had a significant impact. The situation is further complicated by the President's apparent willingness - on health care and on tax policy, for example - largely to abandon his populist constituency and embrace more Paul-Ryan-style policies aimed at further enriching the richest. Where Trump will finally end up remains to be seen - another argument for looking beyond the first 100 days. President Trump's core supporters still seem loyal to him. Nowadays, as we know, partisan loyalty tend to override everything else, including facts and ideology. But his continued strong support among his core supporters may also reflect more commonsense on the part of some of them than on the part of the media - a recognition that it is hard to get everything right - right away. And it may also be an act of faith on the part of a constituency that at present has nowhere else to go. How different progressive politics would be if those on the left showed comparable commonsense when judging their leaders! It's just the first 100 days! There are still another 1360 days ahead! 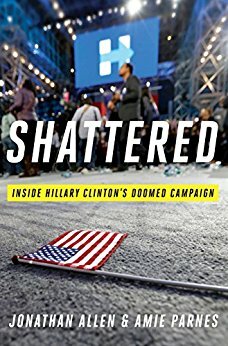 I have just recently read Shattered: Inside Hillary Clinton's Doomed Campaign, by Jonathan Allen and Amie Parnes. The title plays on the Clinton campaign's mission to shatter what she herself labelled "the highest, hardest glass ceiling," but which instead ended up leaving that ceiling solidly in place, shattering instead both Clinton's and the Democratic party's hopes and expectations for 2016 (meanwhile saddling the country with the Trump presidency). The authors covered the campaign primarily through "background" interviews and a commitment to wait until after the election to go in print. It is interesting to speculate how the book would read had Clinton won (as most observers, including the authors) had once expected her to do! For all their criticism of Clinton and of her campaign, the authors remind the reader at the outset that Clinton "collected nearly 65.9 million votes - more than any Republican nominee in American history, just 64, 822 fewer than Barack Obama in 2012, and almost 3 million more than Donald Trump. And she did that while facing a set of trials and tribulations unlike any other in American campaign history: a partisan congressional investigation; a primary opponent who attacked her character; a rogue FBI director; the rank misogyny of her Republican rival; a media that scrutinized her every move while failing to get that Republican rival to turn over his tax returns; and even a Kremlin-based campaign to defeat her." That is actually quite a lot! Unfortunately, it turned out to be not quite enough. So the book becomes a kind of autopsy of what is rightly called a "doomed campaign." Indeed, it is striking how pervasive that sense of doom is throughout the book. Hillary herself is described as someone who "over the course of her life, no matter how good things got for her, she was always waiting for the other shoe to drop." And then then there is the staffer's gloomy mantra repeated periodically: "We're not allowed to have nice things." People who obsess about the sport of politics, which is disproportionately what most political coverage in the media focuses on, will revel in reading about the dysfunctional features of the campaign itself, the conflicts and competition among staffers, all the usual fare of political coverage. And, in its own way, of course, that is interesting. Even more interesting to me is the conflict between two approaches to political campaigning - presented in the book as a somewhat generational divide between politics as "science" and politics as "art." In this account, Clinton's campaign manager Robby Mook personifies the scientific, data-driven approach, while older, more experienced politicians like campaign chairman John Podesta and, above all, Bill Clinton himself personify the more traditional "art" of politics. It was Bill Clinton, for example, more than anyone else, who seemed to appreciate "the transatlantic phenomenon of populist rage." The account reveals a Hillary Clinton who was superbly qualified for the presidency but who was never all that good at what it takes to win it. It is, I've often observed, one of the curious constants of the human condition that some people are liked no matter what they do, while others just can't pass the likable test, no matter what they do. That this itself may reflect a characteristic weakness on the part of human beings in general - and political electorates in particular - does not make it any less true, even if it does make it that much more poignant. But, even in politics, being likable isn't everything. Clinton did, after all, still win many more votes than Trump. which ought to count for something. While the book inevitably highlights Hillary's personal difficulties in making herself liked, her campaign's real problems lay elsewhere. Indeed, Bernie Sanders' populist attack from the left was largely a mirror image of Trump's populist attack from the right. Recognizing the power of the populist threat was something that "Bill Clinton and the older set within the campaign" perceived much better than others. Hence their (ultimately unsuccessful) efforts to move the campaign in the direction of "more contact with voters outside the demographic wheelhouse that created the safe path to winning the nomination." Herein lay Hillary's greatest failure, the failure to grasp "that Trump had tapped into a vein of the electorate that Hillary couldn't locate - and, just as important, that his much narrower focus within the Electoral college provided a viable path to victory." In Clinton's case, this was especially tragic, because the people she was "doing nothing to inspire" were precisely "the poor, rural, and working class voters who had so identified with her husband." Hillary had her faults. Her staffers had their faults. But the ultimate fault was what still bedevils the Democratic party as it struggles to find a way forward - a fundamental state of being out-of-touch that has separated the party from its traditional base of support, even as it has sunk itself deeper and deeper into the swamp of elitist identity politics. Fixing that disconnect is, I suspect, imperative if the party is to regain power. Addressing that issue is infinitely more important (and ultimately even more interesting) than the predictable preoccupation with who in the campaign said what about whom! In the proper liturgical calendar of the Augustinian Order, today is observed as the feast of the Conversion of Saint Augustine. Historically, it was during the Easter Vigil celebration in the Cathedral of Milan, on the night of April 24-25, 387, that the 32-year old Augustine was baptized by Saint Ambrose - along with his 15-year old son, Adeodatus, and his lifelong friend, the "brother of his heart," Alypius. 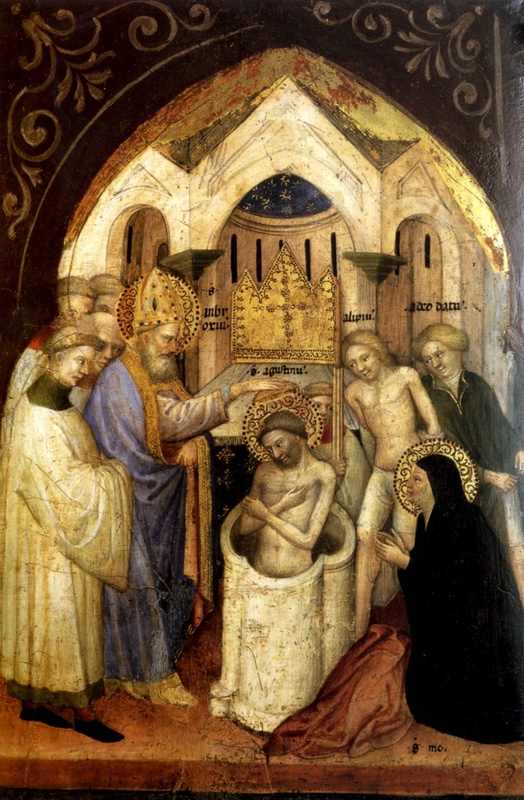 (Photo: The Baptism of Saint Augustine by late 14th, early 15th-century Sienese painter Niccolo di Pietro.) Augustine's baptism completed his now famous journey back to the Catholic faith of his childhood (the faith of his mother, Monica) and the beginning of his new life as a Catholic philosopher and theologian, and eventually a Bishop in his native North Africa and Doctor of the Church. The charming medieval legend that the Church's great hymn of thanksgiving, Te Deum laudamus, was originally spontaneously composed (each one composing alternate verses) by Saint Ambrose and Saint Augustine on the occasion of Augustine's baptism that Easter night in 387 is, of course, just that, a legend. Still, if Saints Ambrose and Augustine had spontaneously composed a hymn of thanksgiving, what better choice than the Te Deum? And who better to compose it that way than those two great Latin Doctors? The familiar story of Augustine's conversion was recounted by Augustine himself a little more than a decade later in the first 9 books of his Confessions. It remains as compelling an account now as it was then. Augustine's Confessions reveal in thoroughly deliberate detail the character of Augustine's religious experiences and what it means to become a member of the Church community. Augustine did not invent autobiography. According to Tacitus, such writing was already antiquitatus usitatum in the Roman Republic. But Augustine's Confessions clearly constituted something different - no mere memoir such as the great (and not so great) commonly compose to justify themselves before their contemporaries and before history. Addressed to God, Augustine's account has God for its ultimate hero. God's grace is at the basis of Augustine's successful journey and leads him to its happy conclusion. It is a totally religious work, and the events recounted - for example, an otherwise apparently trivial theft of pears by an unemployed and mischievous teenager - are included because of their religious significance and emphasized exclusively in accordance with that significance. Augustine's conversion involved a journey of several years through several different philosophical schools of thought - among them, skepticism, Manicheanism, and, most importantly, neo-Platonism. But, as importantly, it was mediated through the Catholic Christian community to which he was exposed and toward which he was increasingly drawn. That community was represented in his life by two overwhelmingly signifiant figures - his mother Monica, who represented what we would today call "popular piety," and Ambrose, who influenced Augustine intellectually but also in his ecclesiastical role as a bishop shepherding his community in Milan through its ordinary and some extraordinary challenges, and thus modeling for him the role he too would eventually be called to play in the Church. You have made us for yourself, O Lord, and our heart is restless until it rest sin you (Augustine, Confessions, Book One, Chapter One). Today, Saint George’s Day, is the Pope’s Onomastico (Name Day). Name days still have a certain resonance in Catholic countries and cultures, and in the Vatican itself the papal Onomastico is annually observed as a legal holiday. All we know for certain about Saint George himself is that he was martyred in the East at the beginning of the 4th century. He was widely venerated in both East and West long before tradition turned the onetime Roman soldier into a medieval knight. 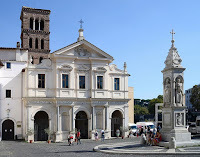 In Rome itself, the second Lenten station - the day after Ash Wednesday - is at the ancient Church of San Giorgio in Velabro, which I have written about before. It is one of those wonderful old Roman churches that I would likely never have gotten to see the inside of, were it not for the venerable Roman tradition of the Lenten stations. Saint Peter Damian (1007-1072), praised Saint George as a man who abandoned one army for another, who gave up the rank of tribune to enlist as a soldier for Christ, and who plunged into the thick of the battle, an ardent soldier for Christ. Medieval tradition portrayed Saint George as a gallant knight who slayed a monstrous dragon. According to Jacobus de Voragine’s famous 13th-century compendium The Golden Legend, George encountered the dragon in Silena in Libya. For some time the dragon had terrorized the town with its poisonous breath. To appease it, the townspeople had sacrificed first their sheep, then their children, and were on the verge of sacrificing the King’s daughter, when George appeared on the scene. George captured the dragon and promised the terrified citizens that he would slay it if they accepted Christ and received Baptism. Unsurprisingly, the king and all the people did so, and George indeed slew the dragon. Before leaving he instructed the king to care for the Church, to honor the priests, to assist devoutly at the Divine Office, and to keep the poor in mind always. In the Book of Revelation, the Dragon is, of course, the classic image of the Evil One, Satan, the Devil, against whom, as Pope Francis himself has so frequently reminded us, the Christian life is a continuous battle. 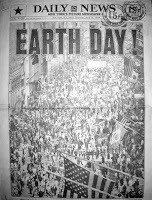 I have always had a certain fondness for Earth Day, perhaps because I can so vividly remember participating in the first Earth Day celebration in 1970 (photo). Back then it was fun (as a lot more things were back then). Now, however, as the calamitous consequences of climate change become more incontrovertibly evident (even as our current government's response to it stands out for its increasing ignorance and stupidity), the occasion seems so much more somber. Certainly the theme for this year - Environmental and Climate Literacy - could hardly be more timely! Since I started this blogging routine, Earth Day has also served as a suitable occasion to recall - and mourn the loss of - the Church's traditional Rogation Days, which traditionally were observed on April 25 (the "Greater Litanies") and on the three days before the Ascension (the "Lesser Litanies"). I have previously written here [Cuckoo Day April 25, 2012] about the pre-Christian roots of the "Greater Litanies" in the ancient Roman Robigalia festival, one of ancient Rome's significant spring agricultural commemorations. As I noted back then, ancient peoples appreciated (so much better than we) their dependence on the natural seasons and the harvest. The change in religion from paganism to Christianity redirected the focus of people's prayers to the true Creator God. But that didn't change their appreciation of their dependence on nature, or their need for a successful harvest, or the catechetical value of ritualizing that on traditional days. And so I also suggested that, in the light of contemporary environmental degradation and the dangers to human civilization posed by climate change's devastating effects, perhaps the bureaucrats who invented our late 20th-century Roman Liturgy may have made a critical mistake in their abandonment of such reminders of our connection - and dependence - on nature. Today's environmental woes (famines, droughts, floods, storms, fires, etc.) and the many social and political crises and conflicts which stem from them wholly or in part seriously threaten our physical world and the human architecture of civilization that has made our planet special. Having been so frivolously discarded half a century ago, the Rogation Days are undoubtedly gone for good, but the case for recovering and retrieving their spirit seems to me to be, if anything, even more obvious than it was then! 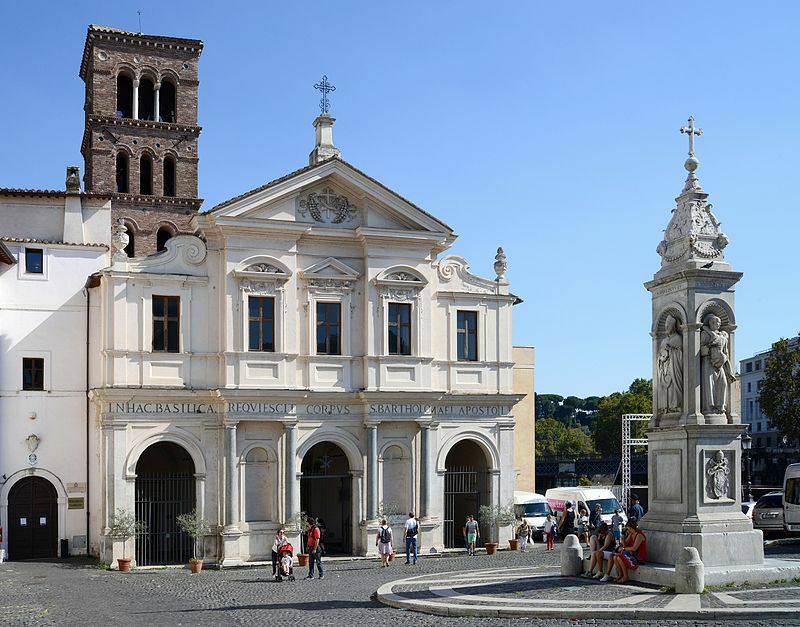 At 5:00 p.m. Rome time tomorrow, Pope Francis will honor the “new martyrs of the 20th and 21st centuries” during a liturgy of the word at the community of Sant’ Egidio’s 10th-century Church of St Bartholomew on Rome’s Tiber Island (la Basilica di San Bartolomeo all'Isola). Founded by Emperor Otto III to house the relics of St. Bartholomew the Apostle, the basilica (photo) is on the site of a former temple of Aesculapius. Since the Great Jubilee of 2000, the basilica has also served as a shrine to the many “new martyrs" of the 20th and 21st centuries. According to a statement released by the Sant' Egidio Community: "The Pope's prayer in a place, which - since the Jubilee of 2000, at John Paul II's behest - contains the memoirs of contemporary martyrs, takes on a very special significance in these times marked by the suffering of so many Christians in the world and by the light of Easter." Last September, the Archbishop of Rouen added Father Hamel's Breviary to the collection of "relics" of these modern "martyrs" that are kept in the Tiber Island basilica. Some of the other mementos of these modern "martyrs" include a missal used by Blessed Oscar Romero, the rock that killed the Polish priest Blessed Jerzy Popieluszko, and a letter written by one of the Trappist monks of the Our Lady of the Atlas monastery in Algeria (whose story was told in the 2010 movie Of Gods and Men). Of course, the 20th and 21st centuries have seen many more who have died for the Catholic faith in addition to those famous figures we have all heard of. 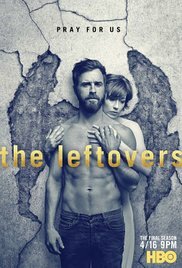 I have written here about this show several times before - my first reactions (July 14, 2014 "The Optics of Despair"), comparing the TV series to the book the first season was based on (July 19, 2014 "Dystopian Despair: The Book"), celebrating season one's penultimate episode that finally depicted the actual Departure day (August 25 "Apocalypse Eve"), reflecting on season one at the end (September 8, 2014 "The Leftovers: Season Finale"), and finally reflecting on season two (October 13, 2015 "The New Leftovers"). My overwhelming impression in season one and continuing into season two was the sense of despair. It reminded me, as I said at the time, of P.D. James' 1992 evocative dystopian novel The Children of Men (later made into a movie) about a world with no more future, because the human race had inexplicably become sterile and stopped reproducing. While in The Leftovers people can still reproduce, the past they have lost through the inexplicable sudden disappearance of 2% of the world's population seems to have burdened everyone's present so much that the future seems beyond any aspiration. While everyone gets to be sad in his or her own special way, the whole thing is like a parable about collective grief - a seemingly apt image for our post 9/11 world. Meanwhile the one "normal" episode - Mapleton on the eve of the Departure - coming near the end of the first season let us all in on all the unresolved problems which the Departure would prevent any final resolution of, leaving grief and guilt as the only possibilities. As I wrote at the time: We identify with the normality that has been snatched from them. But we also wish that they had made better use of those final 24 hours of normalcy to start fixing things they will never get another chance to fix! Then came season two which took the Garveys form Mapleton to Texas and introduced a whole new cast of characters along with them. Their trek to Texas confirmed that you can change your location, but you take your problems with you, and no place is ever really safe from the demons in one's head and heart. Indeed, the weirdly demonic dimension seemed to intensify in season two, especially with Kevin's strange experiences somewhere between life and death. Season three starts with them still in Texas several years later (but seems to foreshadow an ending in Australia). While grief and guilt seem inexorable, one lesson I took away from the first two seasons was how much worse everything was because of the characters' consistent failures to communicate honestly. It looks as if we can expect more of that in season three. With the passage of time, one might hope (even expect) that grief and guilt might be ready to yield to something milder - to disappointment, a kind of chronically resigned existence in the day-to-day. Based on the first episode of the third season, however, the demons that stalk so many of the characters - Kevin, above all - seem even more firmly entrenched. The sacred liturgy is, well, sacred. So it should not be "reviewed" as if it were the latest movie or play. Still, it is meant to be experienced, and how it is experienced is worth considering. Having attended holy Week and Easter services all my life and having been their principal celebrant for several years now myself, my experience inspires me to share my accumulated thoughts, which is, of course, all they are - my personal thoughts. But not all Triduum liturgies are equal. The best attended - for most people probably the only one they attend - is, of course, Easter Sunday morning Mass. For its popularity alone, Easter morning Mass deserves to be any priest's favorite Triduum liturgy. It is where the people actually are. It is the one time the Easter story is actually proclaimed to a real crowd - as Peter got to do on Pentecost. And, for those of us who are old enough to remember, it is one of those rare occasions when the church is actually filled - as churches used to be routinely filled Sunday after Sunday just half a century ago. Palm Sunday is not quite as well attended as Easter any more (nor is it part of the Triduum) but it is still big for lots of people and so is for me. Unfortunately, I have noticed in recent years that more and more people seem to have forgotten (or maybe never learned) what to do with the palms. So either they don't take them at all or, even more revealingly, they return them at the end of the Mass! In the past, the priest used to pray that wherever the blessed palms might be brought those there might be blessed and protected from dangers. Obviously that prayer needs to be retrieved and its message better publicized! Anyway, back to the Triduum. Apart form Easter Sunday morning itself, my personal favorite has always been Holy Thursday - and not just because I happen to have been born on a Holy Thursday! This year, after the Holy Thursday celebration, a friend texted me to say "that was truly fantastic." For me that has always been the case, year after year, which is why it remains my favorite. it makes me more appreciate the traditional wisdom of the Church which expected Bishops to celebrate pontifically those two services - Holy Thursday and Easter morning, while letting them get away with mere "pontifical assistance" (as it used to be called ) on Friday and Saturday. Apart from the recent (1955) addition of the Footwashing (for centuries performed by Bishops and Abbots and Kings and Queens, but always outside of Mass), the Holy Thursday service is simple and straightforward. And yet it in effect celebrates the whole story, proclaiming the lord's death until he comes. We keep the anniversary of Christ's institution of the Eucharist and the priesthood by doing what he did. And, again apart from the Footwashing, the only actual addition to the Mass is the solemn Procession at the end with the Hosts reserved for Communion the following day. This most beloved part of the Holy Thursday ritual highlights the connection with Friday's service and so is not permitted in churches where Friday's service will not be celebrated. The 1955 reform radically simplified the Communion part of the service and extended Communion to all, after centuries in which only the celebrant communicated. This results in the inefficiency of having people come up in procession twice in quick succession. But again no one seems to mind. I have heard some voices actually argue against the Communion Rite, either because they think the Adoration of the Cross would make for a more distinctive ending or because they don't like the now restored ancient custom of Good Friday Communion for all. I could live content with Good Friday ending with the Veneration of the cross without Communion. But that would mean either returning to the previous practice of only the priest communicating (traditional and venerable, but incomprehensible to most modern sensibilities) or eliminating any Communion Rite at all, which would mean abolishing the best loved feature of Holy Thursday, the procession at the end of Mass. For the sake of Holy Thursday, therefore, I'm all for keeping Good Friday as it is! Someone once somewhat insensitively called the Good Friday service a "train wreck," which it assuredly is not, but perhaps such a sentiment might be somewhat more applicable to what is obviously - and for good reason - the least popular (i.e. least well attended) of the Triduum services, the Easter Vigil. I have written here before about how the Vigil seemed to me to make more sense when it still maintained the form of a Vigil, ending with the first Mass of Easter - rather than the radically reformed version we now have, in which the Vigil is really just a very long anticipated Saturday night Sunday Mass. That speaks to the logic of the service (as well as to its historical and traditional forms) but does not really address its extreme length, the factor that (especially at such a late hour) works against it ever becoming seriously popular. I have always loved the Exultet, and I always look forward to the ringing of the bells at the Gloria, and I would add as a third favorite the triple Easter Alleluia. But to experience those beautiful moments, one must endure the tedium of the most boringly arranged Liturgy of the Word. While some of the readings (e.g., from Genesis and Exodus) are interesting in themselves, they are saddled with lengthy responsorial psalms. Since I have always thought of the responsorial psalm as the most boring part of the Liturgy of the Word anytime, the prospect of sitting through several of them in a row does not attract. I say this despite fully understanding that the readings - traditionally in the Roman Rite 12 "prophecies" - are the historic heart of the Vigil and so in a sense what make a vigil actually a vigil! Undoubtedly for those being baptized or received into the Church at the Easter Vigil, the event is justifiably so special for them that the structural problems of the Vigil do not matter. But for almost everyone else, the Easter Vigil remains sufficiently unattractive to tempt very few ever to attend. Still it is the great night of the resurrection, and Easter is the great day of days. Taken as a whole, with all their practical problems, the Triduum and Holy Week are always wonderful to experience. How inspiring indeed! So today - and for the next seven weeks - the Easter Candle, the visual symbol of the Risen Christ and visible reminder of his great victory, stands in a place of honor in the sanctuary, literally lighting our way through the Easter season, as it lit the way for our procession into the church last night, and as the Risen Lord lights our way through death to life. And further to highlight that point - not so prominent perhaps as the altar piece which so impressed Isaac Hecker, but prominently displayed at the side altar - is a classic icon of the Resurrection (photo). It portrays the Risen Christ standing over the broken gates of hell, lifting up from their coffins the common ancestors of the human race, Adam and Eve, – while, on one side, Moses, Isaiah, and Elijah, and, on the other, the Old Testament kings and John the Baptist look on. According to ancient tradition, when Jesus descended among the dead, his (and our) ancestors, Adam and Eve, saw his bright light penetrating the deep darkness they had been stuck in for so long, whereupon Christ released them, and they and their descendants joyfully joined him in celebrating his triumph over death. In the normal course of events, the weekly Sabbath day of rest should have been followed on the first day of the week by business as usual – both for the living, who would go back to their regular daily work, and even more so for the dead, who (then as now) were expected to stay dead. For the disciples who came to see Jesus’ tomb early in the Sunday morning darkness, whatever they thought they were going to do, it was a dead man whose tomb they came to see. They too were stuck in the dark, like Adam and Eve and all the generations in between. But when they got to the tomb, they found something surprising and unexpected – not just the opposite of business as usual, but rather something totally new and, of all the things that God has ever done, the greatest of them all. Which is why the Church sings: This is the day the Lord has made! Let us rejoice and be glad! And yet, however hard it may be for us to imagine (in this age of omnipresent media and the 24-hour news cycle), the news of Jesus’ resurrection was hardly noticed at first. It was the resurrection’s effects which the world experienced. And it is the resurrection’s same long-term effects which we actually experience now, and which have brought us here today – as Jesus’ body that lived and died and still forever bears the marks of his passion emerges from the tomb to transform our world, starting right here and now with us. Easter invites us to put ourselves in the position of Jesus’ disciples – unexpectedly (and excitedly) experiencing something surprisingly new in a world where everything else seems so ordinary and old. In a world which seems permanently stuck in the dark, pre-dawn position, where death always seems to have the final say, the disciples needed to experience the kind of change that could only come from the Risen Lord’s living presence among them. And so do we, which is why we are here, where the Risen Lord brings us together as no one else can. So, instead of the 1st day of the week condemning the world back to business as usual, this 1st day after the Sabbath is starting something new – not just a new week, but a new world, where death no longer has the final say. And we are here, in this holy place today, because God did not stop for good on the 7th day, because there is now a new day, on which God has, so to speak, re-created the world in his Son, Jesus Christ, crucified, dead, and buried, but now risen from the dead. That new day is today – and every day from now on. And that is why we have to come back, Sunday after Sunday, to be filled in on what happened next, and thus experience the effects of the resurrection ourselves. That is why every day for the next 7 weeks, the Church retells the story of the first Christian communities in the Acts of the Apostles - the story of those who first experienced the reality of the resurrection and its power to change the world. Like the disciples in the Gospel for Easter Sunday morning, some of us run fast. Others, beset perhaps by doubts or daily difficulties, run much more slowly. What matters most, however, is where we finally end up. So whether we are runners or walkers, we must accompany the disciples to the tomb, which in a business-as-usual world would have remained dark, but from which the stone has now been removed – so that we can see and believe. The disciples’ story highlights how what was happening then continues to happen in the everyday life of the Church, as the Risen Lord continues to reveal himself to us through the experience we share by baptism as members of the uniquely new community that is the Church, brought into being and animated by the Risen Lord's parting gift of the Holy Spirit. The promises of Holy Baptism, which we will solemnly renew in another few minutes are our solemn and collective commitment together to keep living this Easter story, to be excited by it, and to stay excited about it. Homily for Easter Sunday, Immaculate Conception Church, Knoxville, TN, April 16, 2017. Maria Augusta Trapp (1905-1987) spoke for a generation of mid-20th-century liturgical enthusiasts in Around the Year with the Trapp Family (1955), when she praised Pope Pius XII for restoring the Easter Vigil to its nocturnal setting. "We cannot be grateful enough that the Holy Father, Pius XII, has given back to us the ancient Easter Night! Even as children we felt that something was not quite as it should be when the Church broke out early in the morning of Holy Saturday in the threefold Alleluia, while while the Gospel told us that Our Lord was resting in the grave to rise on Easter Sunday morning. Now the word of the Holy Father has put things straight Gospel told us that Our Lord was resting in the grave to rise on Easter and Holy Saturday has regained its ancient character." That "ancient character" of Holy Saturday is what Maxima Redemptionis Nostrae (1955) called "the special liturgical nature of Holy Saturday," and Pius XII's Holy Week reform did try to instill among us moderns the ancient idea of Holy Saturday as "a day of the greatest sorrow when the Church lingers at the Lord’s tomb, meditating upon His Passion and Death and abstaining from the Sacrifice of the Mass, with the sacred table left bare; until, after the solemn Vigil or nocturnal expectation of the Resurrection, it gives way to paschal joys whose abundance flows over into the following days." This is the day of Christ's descent among the dead, which we profess in the Apostles' Creed, the spirit of which is so eloquently expressed in the ancient Holy Saturday homily which is now the second reading in the post-1969 Office of Readings for this Saturday. That homily speaks of "a great silence on earth today, a great silence and stillness." Of course, unless one lives in an enclosed monastery (and maybe not even there), one is unlikely to encounter too much "silence and stillness" on Holy Saturday. The secular world, of course, keeps to its own rhythm and schedule. So Holy Saturday is like any other spring Saturday with its plethora of activities, which exert their attractive pull on us and get in the way of any "silence and stillness." And, wherever Easter still impacts secular culture, whether in the guise of Easter Egg hunts or in the familiar form of family dinners, it is inevitably also a day of shopping and domestic preparation. Likewise in churches, where theoretically it should all be otherwise, there is little "silence and stillness" on Holy Saturday. In the old days, when the Easter Vigil was celebrated early Saturday morning and the Lenten fast ended happily at noon, the rest of the day was taken up with beautifying the church for Easter, while priests settled in for six or so hours of confessions in preparation for the great feast. Those long lines of Holy Saturday confessions are largely gone, of course, but the busy work of beautifying the church still occupies time and attention and is likely if anything even less like "silence and stillness" than it then was. And this is so even though the Vigil has not yet been celebrated, and it is still liturgically only the second day of the Triduum, when the church should still be bare with only the uncovered Cross as a focus of attention! Obviously, the late hour of the Vigil, coupled with the fact that the Missal of Paul VI has replaced the traditional formula of Vigil followed by Mass with what is now essentially just one long Mass, makes it impractical to postpone beautifying the church until after the Vigil. Also, with the Vigil now assimilated to the even more modern practice of anticipating Sunday Mass on Saturday evening, people expect to experience the fullness of Easter at the Vigil, not just a first glimpse of it in the traditional manner. Indeed, the rubrics now speak of the Vigil as "a paschal Mass of the Sunday of the Resurrection." The casualty of all of this is, of course, the "silence and stillness" that were supposed somehow to characterize Holy Saturday. The lessons are obvious. First of all, in case we didn't know it already, we are just not good at "silence and stillness." Secondly, we are not good at waiting either. The Easter Vigil is increasingly celebrated earlier and earlier, assimilating it more and more to the standard Saturday night schedule - exactly what happened centuries ago, when the Vigil got assimilated to the standard Lenten afternoon schedule and then got anticipated earlier when all the other Lenten afternoon were also anticipated). So, as in the past, it increasingly already looks and feels like Easter by noon on Saturday! So much for Holy Saturday having "regained its ancient character"! But that we have been there before and have lasted this long and managed well enough!